"Bears in the Bitterroot" is our Patchwork Quilts block for the 2014 Big Sky Shop Hop and we have had a lot of very positive feedback. Another name for this block is Carpenter's Frame. I found this interesting information on Block Fab HD, a free app that I downloaded onto my IPad. This particular block is an 8x8 grid and has 36 (yes that is 36) half-square triangles...for one block! I was required to make a block and send it to each of the shops in our circle, but I was behind schedule. Normally I cut squares measuring one-inch larger than the finished square and sew ¼-inch on each side of the dangle, cut apart, and square it up to the precise size. I was telling Marilyn (well maybe whining) what I needed to do and she suggested I use the Strip Tube Ruler. She told me how much faster it was than any other method. I was skeptical, but in a hurry. WOW, OH WOW - how cool it was. I made fast perfect half-square triangles in half the time! I plan on using this wonderful ruler whenever possible for my projects. 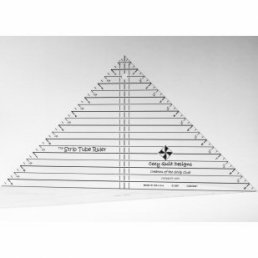 This ruler makes half square triangles a breeze by combining brilliant engineering with "the tube technique." It's perfect to use with strips and even includes directions to make our favorite block from 2½" strips: The Daniela Block. With this great gadget, you can easily make accurate half square triangles from 1" to 9½"! Stop in to Patchwork Quilts and see a demo on how to use this cool new ruler. It will truly change your life.